The Majority of the Robotech Saga has been added to iTunes, Amazon, Xbox Live, and IGN Direct2Drive. Notice that Robotech II: The Sentinels, Flash Back 2012, Macross II, Macross Plus, Macross 7, Macross 7: Encore, Macross Dynamite 7, Macross Zero, and Macross Frontier are not on the list. 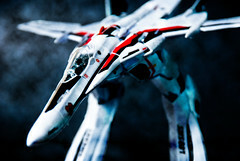 I realize that Macross and Robotech are not technically the same thing, but I think they belong together. After all, Robotech was based on Macross.